Riddle is a small, shallow lake in the lodgepole pine forest south of West Thumb Bay on Yellowstone Lake, and may be reached by an easy 1.75 mile trail that crosses level, marshy land popular with foraging bears in late spring and early summer, on account of which the path is closed each year, from the end of April to mid July. Even after this time, the NPS recommends that hikers travel in groups of four or more. The lake is made more scenic than average by thousands of lily plants that grow along the edges, and because of the high backdrop to the south, formed by the volcanic peaks of the Red Mountains. 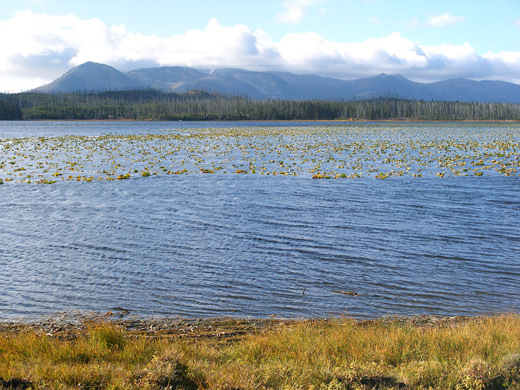 The name Riddle Lake was bestowed by early explorers who thought that its water flowed both east and west, either side of the continental divide, though it actually exits just to the Atlantic side, draining into Yellowstone Lake via a slow-moving stream (Solution Creek). The trailhead is right on the continental divide at elevation 8,000 feet, along the South Entrance Road 2.3 miles south of the turn-off for Grant Village. The well used path passes through typical mixed, fire-damaged forest of surviving old trees, dead trunks, fallen logs and small new pines, and stays fairly level all the way to the lake. It starts through quite a dense patch of woodland, runs alongside a boggy area containing a small stream then moves to slightly drier land where the trees become more widely separated, and the ground is covered by short grass. 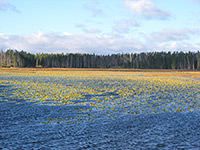 Riddle Lake is first glimpsed when still half a mile distant, as the path crosses two small creeks in the middle of narrow strips of open grassland, extending from a much bigger marshy region that borders the northwest shore. The last section of the trail climbs a little then drops down to a narrow strip of sand lining the edge of the lake, which is followed eastwards a way before ending at a wider beach on the far side, formed of black sand. 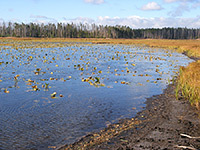 The northwest corner of Riddle Lake is covered by numerous lily pads, merging with reeds and tall grass marshes, though most of the rest of the shore is quite thickly wooded. The meadows are good places to spot wildlife including bears, moose and elk, but if none are in view then at least the soft mud and sand by the water's edge usually has a variety of hoof and paw prints to inspect.